This week, I’ve spent $116.67, for a June month-end total of $392.71. Wow, I didn’t think I was going to make it this month, with the “extra” items like fish oil & entertaining costs! This week, there wasn’t much money left, so I carefully planned meals, stuck to specific shopping list(s), and made sure I only got what was really needed, and it worked! These “extra” items totaled $70 for June, and it initially made me re-consider my budget parameters for next year, especially supplements, which could easily be moved to a separate budget. But then I realized isn’t that what budgeting is all about. Setting up a budget parameter and doing your best to stick with it? Yeah, I can pretend that supplements aren’t really “food” but I proved to myself that it can be done with a little bit of effort and creative adjustments. Ha! Now ask me again when I need to buy fish oil next time. I’ll probably be whining again! 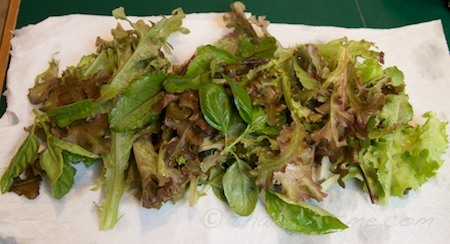 Thankfully there wasn’t much need for store-bought vegetables this week, because my garden has produced some greens and I still had produce leftover from prior week. I did need lots of fruit though! Whole Foods Market $39.38: Bargain shopper! Even though I don’t include health/beauty products in my food budget, I got a great deal on two Kiss My Face items. I had two manufacturers $3 coupons as well as two WF $2.50 coupons. Since my two “Kiss My Face” items totaled only $9, the coupon credit of $3 was deducted from my food purchases! Yay. So, I purchased: salsa, red wine vinegar, peanut butter (non-organic), organic ranch dressing, organic ketchup (DH), local feta cheese, (2) Muir Glen tomatoes ($1 off 2 coupon), (non-organic NJ) blueberries, sm bag of organic cherries, (4) organic peaches, (3) mangoes, (3) organic bananas, and 1 lb SAF instant yeast which I haven’t decided if I’m keeping since it’s “made in Mexico” and adds ascorbic acid, which I just found out is a GMO ingredient. Gardening Store $0: I originally purchased an 8oz bottle of BT Thuricide, a safe organic solution for worms in my cabbage and brussels sprouts plants, but I decided to return the bottle. I’d like just continue to manually pick off the little buggers myself. Meat CSA $26.04 – (Luckily, products from the Meat CSA are paid in full, so technically no real money is actually spent, but I apply the cost to my budget as I cook/eat it.) I was planning on defrosting a less expensive skirt steak from my February delivery, but when I noticed the beefalo brisket was getting a touch of freezer burn, I took that out instead. I think some of the vacuum seals are loosening. I gotta start using up some of this meat, even if it’s just to cook and re-freeze. Saturday: Family Graduation party – big lunch! 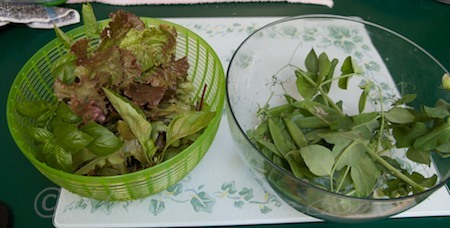 Cut a bunch of lettuce & basil, just a few tender beet greens, a few pea shoots (I’m growing shoots in a separate container), bunches of pea pods, a few sprigs of oregano, and two very small green Carmen peppers. So far, the only pepper plants with fruit are the Carmens and the plants are still so short/small, the fruit is larger and starting to drag. I figured I’d try cutting off two fruits to allow the plant to maybe catch up and grow some more! I had heard that it encourages the plant to grow more fruit if you pick the peppers while they are green, as opposed to waiting until they turn red. This will be an experiment! Yesterday, I caved and bought a bottle of BT-Thuricide (Bacillus Thuringiensis), which is an organic solution for cabbage worms/larva. 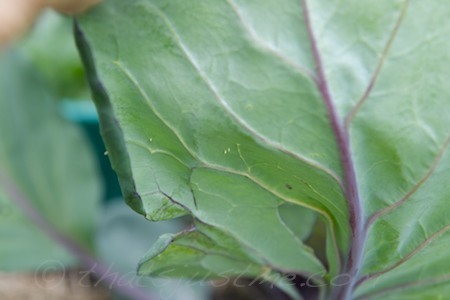 It was very easy picking off the tiny little yellow worm/eggs from the cabbage outer leaves, see my photos above. But then I noticed there were a bunch of worms snacking on inner leaves and it’s a lot more difficult to get them out! The organic experts say BT is safe, but I still am reluctant to use it, mainly because it can cause resistance if overused. It’s especially disconcerting that they are “weaving” BT into Genetically-Modified (GMO) cabbage plants, which will eventually make BT useless for caterpillar/worm control! UPDATE: 2012-06-27 I returned the BT. I decided that I would keep trying to pick off by hand. 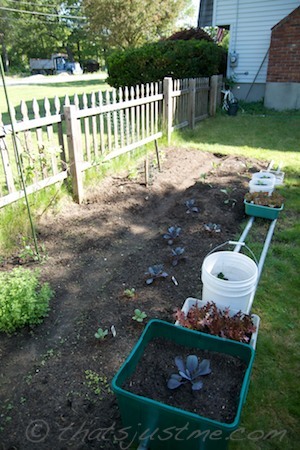 Other than that, most of my plants are doing very well, in-ground and in-containers. The only plants with issues are the bell peppers. I guess it might be more difficult to grow in the North. Most of them are looking “black” and losing their leaves. It could be from overwatering and not enough “heat.” I don’t know if I’ll attempt to plant bell peppers again next season. This week, I’ve spent $62.29, with a monthly total of $273.48. That leaves $126.52 for the rest of June. I really wanted to spend a lot less this week, in order to compensate for the planned Trader Joe’s $50 splurge by the end of the month, but I did stick to my allotted $60-ish for the week. DH informed me that he needed more fruit for his lunch, so I was happy to oblige. Eggs $6 for two dozen. I found a new place to purchase fresh eggs. Smaller eggs, but they are from a small backyard farm. Market Basket $7.48: Potatoes and ranch dressing – eeek, not something I’d buy normally, but it’s for family party, and I needed an easy roasted potato salad. Winchester Farmers Market $18.35: First time at this market, it was like a small festival. I loved it! Walked around once, then walked around a few more times to pick and choose a little something from various farms. Warner farm $2.50 for snap peas ($4/lb, same as Wilson Farm) – seems like a nice small farm, they had both organic and non-organic IPM strawberries also. I like that they grow with a lot of care and consideration. I will buy from them again if I visit this market. Hanson farm: $2 radishes with greens. I had a nice conversation with the woman there about radish greens and what I like to do with them. I can tell it’s a small farm that cares. According to their CSA page, 2/3 of their crops are (non-officially) organic and the rest are grown using IPM (integrated pest management). If I return to the market, I’ll be sure to keep supporting them. Lanni Orchards: strawberries $6 – they seem to be a larger farm/orchard. The gentleman at the booth didn’t really know a lot except that they did spray the berries with a low-grade pesticide. He didn’t know about the lettuce. I wasn’t thrilled about purchasing sprayed strawberries, but they were a $1 cheaper than Warner Farms. Looking back, I should have spent the extra buck perhaps. EL Silva farms $7.85 – huge lettuce $2.50 (lettuce was not sprayed, but they do spray, so he suggested to ask every week for details), bunch of beets w/ greens $3.00 and 2 small zucchini $2.35 – they also had green house tomatoes, but I want to wait for the real thing. 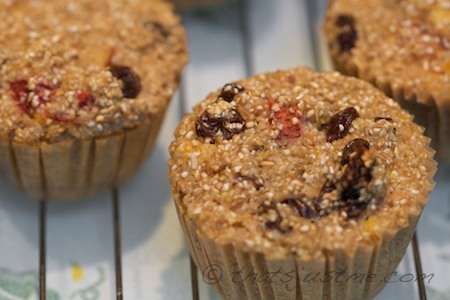 BJ’s Wholesale $12.27: I was surprised to find so many organic offerings. We started a 60 day trial and picked up organic blueberries (.50 coupon), organic grapes, plus a pineapple. DH needs more fruit for his lunch! I wanted to share some of the photos I took of my little veggie garden. It started off smaller, then expanded, and expanded. For now, I’m posting wide angles, but soon, I’ll share more detailed photos to show the growth of each plant. 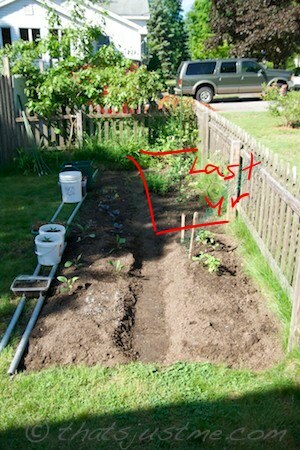 Last season, we started with a very small patch of garden, as you can see from notes on two photos. Our first expansion was adding a few more feet next to the fence, and another row with a pathway. Here’s what it looked like on 5/24 (with notations for last season). We’ve got (1st row near fence) snap & shell peas, a large perennial oregano plant, beet seedlings, more peas, pickling cucumbers, then (2nd row), carrots, lettuce, brussells sprouts, red cabbage, and eggplant. In containers, there’s red cabbage, potatoes, (2) lettuce, and (2) brussels sprouts. Oh and we also have grape vines in the fence corner, and another vine in the middle area of the fence. The containers were placed on top of long metal fence posts to allow good drainage. 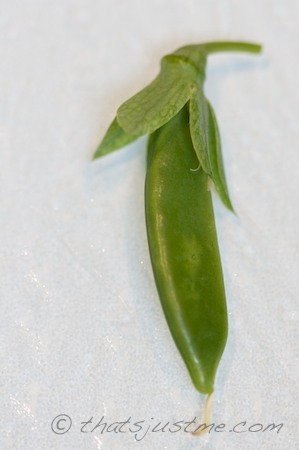 I noticed my first snap pea pod in the garden yesterday! 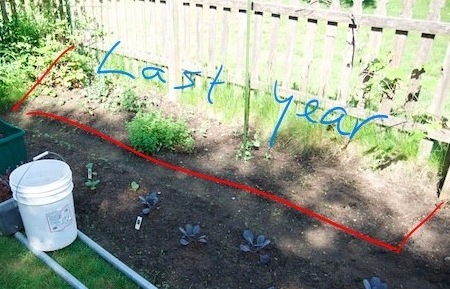 I’m sure it’ll wear off soon, but it’s all so new and exciting to me, since this is my first year with a real vegetable garden. This week, I’ve spent $62.88, with a monthly total of $211.19. That leaves $188.81 for the rest of June’s budget, about $60 per week. We lucked out this week, in that we both of our two “dining out” dinners paid courtesy of others. NICE! On the negative side, I felt like we were backtracking into bad habits. Eating high fat, high sodium, low nutritious junk meals at chain restaurants. Ugh. I put a stop to it, and for the rest of the week, we ate healthy. I’m hoping that I’ll do okay for the rest of the month, we have three weekends of parties coming up, starting with Father’s Day, so we’ll see how that goes. I have the Trader Joe’s “Get $5 Back if You Spend $50” from MyLinkables.com looming over my head. Hmm, yeah, it’s free $, but if I have to force myself to spend $50, is the $5 worth it? I have until the 27th to decide if I have enough money in the budget. Looking at my current TJ’s shopping list, I’m at about $40-$47, and I could easily add some organic chicken legs for the dogs, which doesn’t count for my groceries. Wilson Farms (large local farm) spent $7.39 for $32.39 worth of produce, plants & seeds: Whoo hoo, BARGAIN shopper! Groupon offered $15 for $30 – I had a $10 referral credit on my Groupon acct, so it only cost me $5 for the groupon plus $2.39 for the extra purchase amount. I bought 6pk basil plants, 6pk red lettuce plants, pk of seeds, along with local radishes, local snap peas, (2) local lettuces, asparagus, tomatoes, and organic nectarines. PLUS, they were having a “Grand Re-Opening” special day, giving away a bag of goodies, like shelling peas, homemade donuts & blueberry bread, jelly, root beer, granola, and apple juice sample. It was a great morning! Whole Foods $24.73: organic raspberries (Driscoll’s .50 coupon! ), 5lb bag o’ organic carrots, organic celery, (2) organic canned tomatoes, organic salsa (.50 coupon), block of parmesan cheese (NOT the good stuff, but I liked it actually better than Reggiano), and organic jelly ($1 coupon). Market Basket $9.22: (3) oranges, (5) bananas, and a large watermelon. Geez, watermelons are expensive ($6). I liked Trader Joe’s price last week! But the one watermelon was very large, and it lasted for many snacks! Meal planning is still helping a lot. I sometimes forget what was planned for dinner that day, and it’s so easy to take a peek at my meal plan for the details. Not having easy access is what made it more difficult to stick to my plan before. 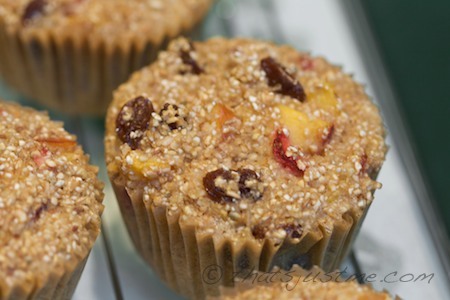 It’s never too late to join the Project Food Budget! There’s still plenty to learn and experience!